Julie Doucet - ZineWiki - the history and culture of zines, independent media and the small press. 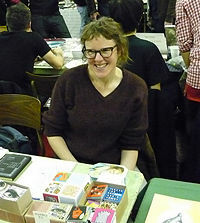 Julie Doucet is a artist and zine editor from Montreal, Quebec, Canada. She rose to prominence as an underground cartoonist, best known for her autobiographical comics such as Dirty Plotte and My New York Diary. In the late 1990s she abandoned the medium of comic books and went back to printing.Woodcuts, linocuts and silkscreen printings are followed by an abundant production of artist's books and zines. This page was last modified on 18 November 2012, at 13:06.